You will love Oneroa Pied-a-Terre for the absolute ease and convenience of location coupled with the bright, modern, spacious layout. Catch glimpses of the glimmering sea whilst relaxing on the large front deck, play on the expansive lawns with the kids or just grab your towels and head down to the beach beach. 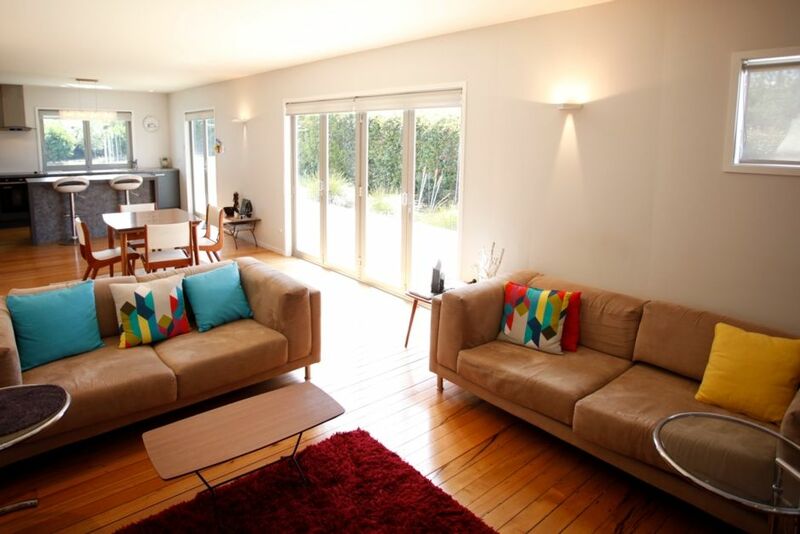 This is the perfect home for families to relax and enjoy everything Waiheke has to offer. - Close to buses and ferries. - Vineyards and wonderful coast and bush walks are nearby. Everything you need is within walking distance: Fine dining, Vineyards, beautiful beaches, the local cinema, boutique shops and galleries, grocery shopping and post office and the bus stops for exploring further afield. There are plenty of breathtaking coastal walks you can take from the doorstep. Great place, neat and tidy. The property was immaculately set up with absolutely everything you could want for a wonderful weekend on Waiheke. It is in the perfect location, and gets amazing all day sun. Hope to be back soon, and would highly recommend! The property was very lovely. The property was very lovely. It was well stocked with everything and anything you would need for your stay. A great quiet location, close to shops and restaurants, beaches and transport links. We didn't have any luck connecting to the free local wifi. Perhaps for a property of this size and cost, it could be considered as an available facility. All in all, a wonderful property and made our stay on the island a wonderful experience.